To help support the preservation of these historic resources, areas of Prospect Heights have received historic designation from the City of New York, as well as from the State of New York and the National Park Service. These designations carry important responsibilities and benefits for owners of properties with the neighborhood's historic districts. More information about applying for a permit from LPC is available here. Permits for work that conforms to the Rules of the Landmarks Preservation Commission can be issued by a staff preservationist. Permits for work that do not meet the rules require a review by the full Commission at a public hearing. If this is the case, you must contact Community Board 8, and schedule an appointment to present your project to the Board's housing committee before you present your project to the full Landmarks Preservation Commission at a public hearing. PHNDC usually testifies at LPC hearings on projects in the Prospect Heights NYCL district, so we recommend you also contact our Landmarks Committee to discuss your project in advance as well. Originally a district of 305 contributing buildings added to the National Register of Historic Places in 1983, the Prospect Heights NR district was expanded in 2016 to include nearly 920 buildings, a superset of the buildings in the NYCL district. Owners of properties in the NR district are eligible to receive State and federal tax credits to help offset the cost of rehabilitating their buildings. A map of the NR district, showing eligibility for State and federal tax credit programs, is here. The Federal Historic Preservation Tax Incentives program encourages private sector investment in the rehabilitation and re-use of historic buildings. A 20% income tax credit is available for the rehabilitation of historic, income-producing buildings. 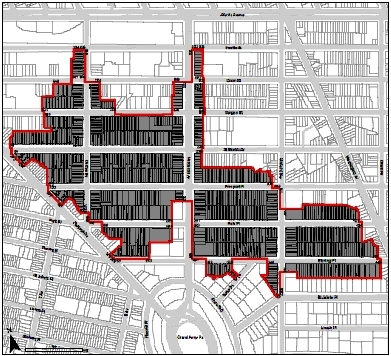 All income-producing properties in the Prospect NR district are eligible for this program. More information is available here. New York State offers incentive tax credit programs to owners of income-producing properties, as well as to owners who occupy residential properties. The credits cover 20% of qualified rehabilitation expenses. More information about State tax credit programs is available here. To be eligible for New York State preservation tax credits, a property must be located in a distressed census tract. 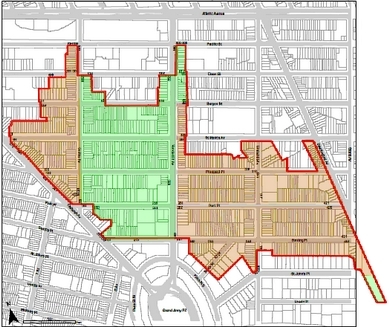 This map of the Prospect Heights NR district shows the properties in distressed census tracts as of 2016 shaded in green. It's important to note that federal and State tax credit programs require property owners to receive approval before incurring expense on their project. Both federal and State agencies also recommend property owners to consult an accountant for advice on applying for these programs.